The NHS is Europe’s largest public sector contributor to climate change. It requires new forms of intervention if it is to meet its 2050 carbon reduction targets. To date, efforts to reduce carbon emissions associated with energy demand have concentrated on improving the energy efficiency of technologies and buildings, and on persuading individuals and organisations to change their behaviour. This research is informed by the DEMAND Centre’s distinctive theoretical approach to the study of end use energy demand – that it is more usefully understood as an outcome of social and institutional practices. 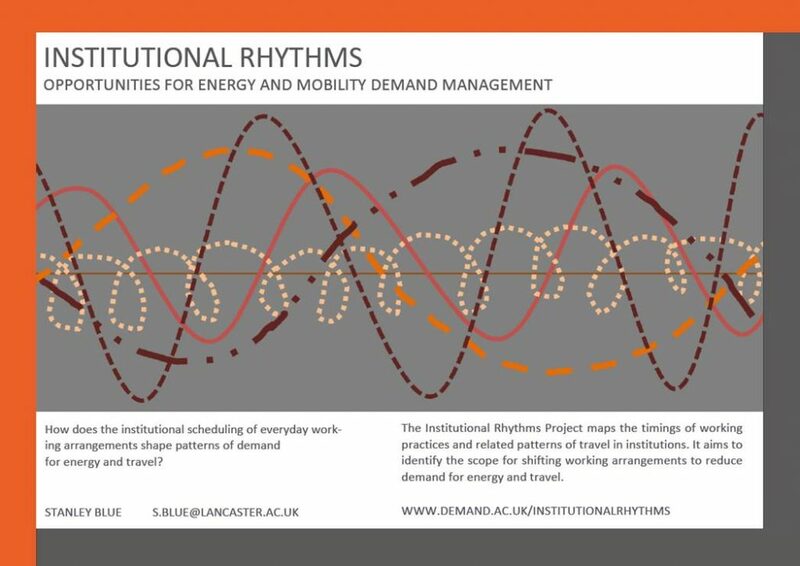 The project responds to the challenge of reconfiguring patterns of energy demand and mobility in the non-domestic sector through a study of the scheduling and timing of working and mobility practices that consume energy within institutions. The close relationship between working practices and energy demand means the success of initiatives to shift peak load, or promote low carbon transport, ultimately depends on the capacity to modify the temporal rhythms of institutional life. Detailed empirical research at three large, acute hospital sites will provide much-needed insight into the potential for such innovation. To map the institutional rhythms of working and mobility practices at two large hospitals. To understand the impact of non-energy policies and priorities on the temporal organisation of those practices. For more information on the research project download the Research Summary. For more information on collaboration and participation download the Project Brief. This is a DEMAND centre linked project. It is funded by the DEMAND Centre and the EPSRC.